When three Tasmanian children meet a couple of home-alone Kiwi kids who live on an old barge, they soon find themselves heavily involved in a conflict with one of the local oyster-farmers. The outcome is a signal to youngsters everywhere that it is possible to bring about positiv... read full description below. 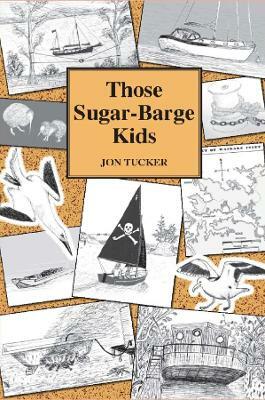 The fourth title in Jon Tucker's 'Those Kids' series of environmentally themed adventure books is nominally targeted at the 10-14 readership, but with considerable appeal to adults as well. The setting is New Zealand's Far North waterways (an inlet in the Bay of Islands), involving Australian and Kiwi alternative lifestyle children who take on the local oyster farmers over their careless use of plastics in the local waterways. A highly contemporary book - both in technology and values - despite its seemingly old-fashioned initial appearance. With its themes of sealevel rise, the plastic threat and predator eradication, it is already being hailed by teachers as a potentially valuable classroom resource, like its prequels. It has been constructed in readable-length six-page illustrated chapters, to make it suitable for adults to read aloud in twenty-minute bites, and to interest reluctant (or time-constrained) readers. Jon Tucker is a Kiwi ex-teacher turned adventurer whose piratical black ketch is the only home that he and his wife Barbara owned for most of their lives. For two decades they and their five sons extensively sailed the waters of New Zealand, Australia and the Pacific. Their accumulated experiences have provided Jon with sufficient material, both true and imaginative, to write this linked series of environmental adventure books.